Let’s start with dragging out the blocks to create a flashing heart animation. You can do that by stacking two ||basic:show leds|| blocks in a ||basic:forever|| loop. // this is the "forever" block. // It makes the code inside of it run in a loop, over and over again. // this is the "show leds" block. // It reads the text (. # . ...) to figure out which LED is on. // this is the second "show leds" block. // all LEDs are off so it only contains '.' characters. The comments will show up in the blocks too. Quickly switch over to Blocks and back if you want to see what it looks like. Let’s draw a small heart in the second basic.show leds string. We’ll do that by replacing some of the . characters with a #. As you make your changes, the simulator should restart and modify the animation just like when you’re coding with blocks. Let’s break the code by adding some random text in the editor. 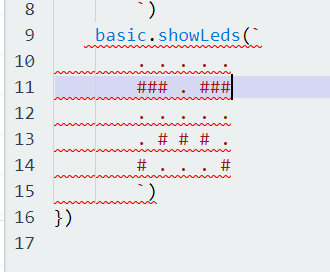 After a few seconds, you should see squiggles show up under the code, just like you do a typo when writing a message. The code editor really needs this error fixed before it can run your code. If you hover over the squiggle with your mouse, you’ll get an explanation for what’s wrong… that might sound even more confusing! This is OK, simply use Undo to trace back your changes until you are back to code that does not have any errors. Click the Undo button (bottom toolbar) until your code is correct again. If you go too far in undoing, click Redo to bring the previous code back.